Improving the look of acne scarring with the latest in cosmetic dermatology. Acne is something most of us have experienced at one time or another. As many as three out of four teenagers have experienced it to some extent. It is most prevalent during adolescence because hormonal changes stimulate the sebaceous glands (oil glands) into producing more sebum (oil), increasing the chance of acne. While most people outgrow acne in their late teens or early twenties, many continue to be affected much longer. Aggravation of acne in later life may occur with menstrual periods, use of birth control pills, use of oil-based products and stress. Acne occurs when the oil produced by sebaceous glands does not reach the surface of the skin but is trapped in tiny pores or follicles. This plug may close off the pore, causing the follicle wall to bulge, which creates a whitehead. If the pore stays open, the top surface of the plug may become darkened, causing a blackhead. In both cases, the bacteria, P. acnes, thrives in the clogged follicles. When the bacteria and pus leak from the follicle into the surrounding tissue, pimples are formed. You may have heard that "blackheads are dirt"; "only teens have acne"; "junk foods cause acne"; or "it will just go away by itself." These and other myths have prevented many from seeking the appropriate acne treatment for years. Acne treatments are performed by Dr. Petrin for patients from Redmond, Kirkland and Bellevue. During your consultation the doctor will determine the severity of your acne and may select one or more treatments that are best for you. The basic steps of acne control may include topical antibacterials and antibiotics, oral antibiotics, comedolytics (such as Retin-A™), sebostatics (such as Accutane™), astringents and exfoliants. High Intensity blue-light designed specifically to kill the bacteria responsible for acne vulgaris. Microdermabrasion with and without vitamin C ascorbic acid. Photothermolysis laser treatments targeted to stimulate a photoactivated byproduct which kills P. Acnes. More than 12 million Americans suffer from varying degrees of acne scars. Even a mild case of adolescent acne can leave permanent scars throughout adulthood. In addition to physical trauma, for many, acne scars can also have adverse psychological effects. Physicians say that the scarring itself represents only a small part of the actual damage. To gauge the psychological effect of acne scarring, the makers of injectable collagen gathered a focus group of men and women to discuss their feelings before and after acne scar treatments. This study found that people with acne scars tend to be very introverted, often holding their heads down, covering their faces with their hair, and generally avoiding eye contact. Many of them carry a great deal of guilt — as if the scarring were their fault. Many sufferers "blame their skin" for things that go wrong in their lives. After treatment of their acne scars, members of the focus group regained their self-confidence and felt more at ease in social situations. Fortunately, our physician performs a range of procedures for patients from Redmond, Kirkland and Bellevue to successfully treat severe and mild acne scars. Injections with Collagen, Restylane®, and Radiesse™ are good treatments for shallow and deep acne scars. These fillers can be injected into the area of the scar, smoothing depressions. Results are immediately apparent. Patients usually require touch-up treatments every 6 months to 2 years. Dermabrasion is often recommended for severe acne scars and works well on both raised and grooved areas of the skin. The skin is first treated with an anesthetic, and the top layer of the skin is then "sanded down" with a wire brush or diamond burr. Seven to ten days later, the skin forms a new, smoother layer. Patients can expect full recovery in about 6 weeks. Microdermabrasion can be likened to a superficial "skin polishing" using micro-crystals vacuumed over your skin's surface to remove damaged skin cells. These gentle treatments can provide noticeable improvement to acne scars. The treatments are progressive and are applied through a course of weekly sessions. Chemical Peels use a chemical solution to burn away the fine outer layers of the skin. The solutions are available in several strengths, depending on the degree of peeling desired. Healing can take from 3 days to 3 weeks. A new, smoother layer of skin is then formed. Non-Ablative Laser Treatments do not require anesthesia, as they are not painful and there is no downtime. Most patients receive a series of about 5 treatments. Depending on the type of acne scar, improvement can be dramatic. The improvement is gradual and continues to improve even after the treatment stops. Laser Resurfacing gives your physician precise control as the procedure gently vaporizes the damaged or acne-scarred skin to reveal the smooth, fresh skin underneath. Scars are removed in a precise, rapid, bloodless fashion achieving excellent results. Laser scar removal can be performed with local anesthesia if limited areas are treated, while full face resurfacing is usually performed with the administration of intravenous sedation by an anesthesiologist. Both procedures may be performed in your doctor's office. With all of these procedures at our disposal, your treatment can be tailored to achieve your expectations. 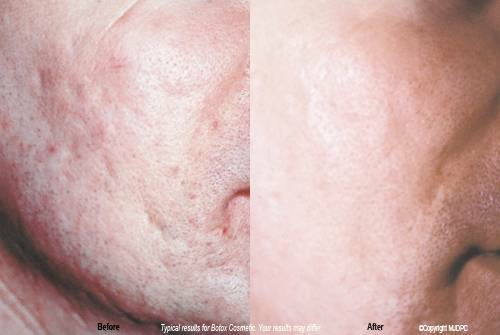 After Dr. Petrin performs acne and acne scar treatments, patients are thrilled with the results.